Lloyd, co-owner of Fragrant Orchids, contacted us a few days ago in regards to website hosting and website maintenance services. He had informed us that the website maintainer he used for years had retired and needed a new person to take over. BsnTech Networks was happy to help. Overall, Lloyd has a total of five different websites which he will transfer over to us in time – two in November and three in December. In order to assist Lloyd with the transition, we worked him for a couple of hours last night in order to remotely setup their two computers – a Mac and a PC – with their e-mail accounts. Ensuring that our customers have a seamless transition during these times is very important. We look forward to working with Lloyd for several years as we manage his websites! 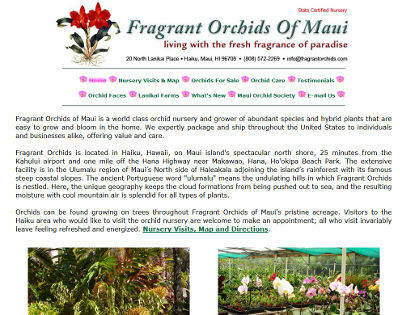 The Fragrant Orchids site is at fragrantorchids.com.